Cyclades is the the synnefo Compute and Network Service. It implements OpenStack Compute API v1.1 + synnefo extensions. Cyclades is the Compute/Network software component of synnefo. 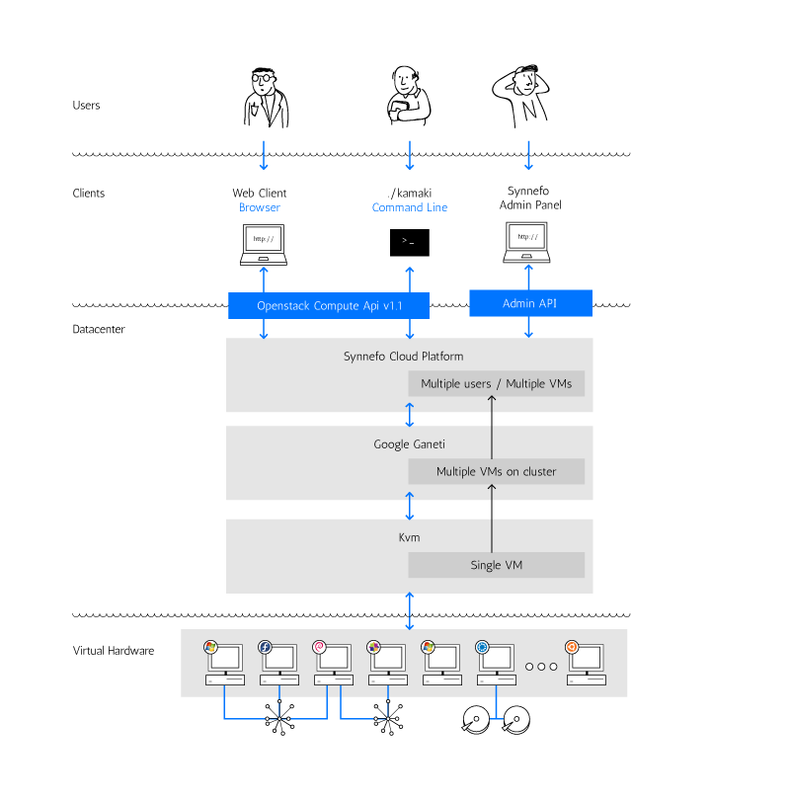 Its design combines a Google Ganeti backend for VM cluster management, with a Python/Django implementation of the user-visible API at the frontend. We opted to reuse Ganeti as a VM management solution in an effort not to re-invent the wheel; Ganeti is scalable and proven software infrastructure for managing VMs in production environments, and GRNET already had long experience with it, using it to provide VMs to Network Operation Centers. The synnefo team is involved in Ganeti development, contributing patches upstream. With Cyclades, users have access to VMs powered by KVM, running Linux and Windows guests on Debian hosts and using Google Ganeti for VM cluster management. The VMs are accessible by the end-user over the Web or programmatically (OpenStack Compute API v1.1). Users have full control over their VMs: they can create new ones, start them, shutdown, reboot, and destroy them. For the configuration of their VMs they can select number of CPUs, size of RAM and system disk, and operating system from pre-defined Images including popular Linux distros (Fedora, Debian, Ubuntu) and MS-Windows Server 2008 R2. There is an Out-of-Band console over VNC for troubleshooting. The REST API for VM management, being OpenStack Compute v. 1.1 compatible, can interoperate with 3rd party tools and client libraries. GRNET has added custom extensions for yet-unsupported functionality. It has been implemented in Python, using the Django framework, from scratch. Nodes in an cyclades deployment belong in one of the following types. For every type, we list the services that execute on corresponding nodes. Throughout this guide, node refers to a physical machine in the deployment. A node [or more than one nodes, if using an HA configuration], running a DB engine supported by the Django ORM layer. The DB is the single source of truth for the servicing of API requests by cyclades. A node running the api application contained in snf-cyclades-app. Any number of APISERVER nodes can be used, in a load-balancing configuration, without any special consideration. Access to a common DB ensures consistency. A node running the RabbitMQ software, which provides AMQP functionality. More than one QUEUE nodes may be deployed, in an HA configuration. Such deployments require shared storage, provided e.g., by DRBD. A node running the business logic of synnefo, in Django. It dequeues messages from QUEUE nodes, and provides the context in which business logic functions run. It uses Django ORM to connect to the common DB and update the state of the system, based on notifications received from the rest of the infrastructure, over AMQP. A single GANETI-MASTER and a large number of GANETI-NODEs constitute the Ganeti backend for synnefo, which undertakes all VM management functions. Any APISERVER can issue commands to the GANETI-MASTER, over RAPI, to effect changes in the state of the VMs. The GANETI-MASTER runs the Ganeti request queue. the synnefo Ganeti hook, ganeti/snf-ganeti-hook.py.